Prototype: French State Railways (SNCF) class BB 9200 electric express locomotive in the classic blueish green paint scheme. The locomotive looks as it did around 1973. Built starting in 1957. 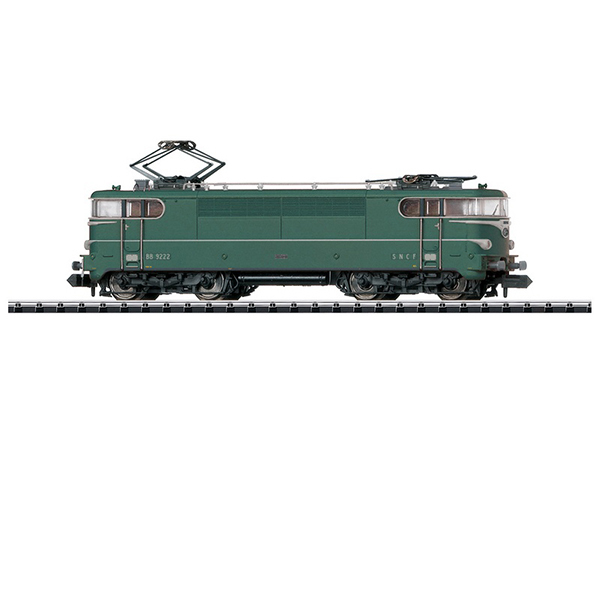 Model: This model has a tooling change and includes double-arm pantographs (roof equipment). The locomotive has a built-in digital decoder and sound generator for operation with DCC and Selectrix. It also has a motor with a flywheel. 4 axles powered. Traction tires. The headlights and marker lights change over with the direction of travel. Warm white LEDs are used for the lighting. The headlights, marker lights, and cab lighting can be controlled digitally. The locomotive has a close coupler mechanism. It also has separately applied grab irons. The headlights and marker lights change over with the direction of travel in analog operation. Length over the buffers 101 mm / 4".